Juniper Berry (Juniperus communis) essential oil is a colorless to pale yellow liquid displaying a warm, green, resinous, coniferous bouquet with a warm woody-balsamic-nutty undertone. 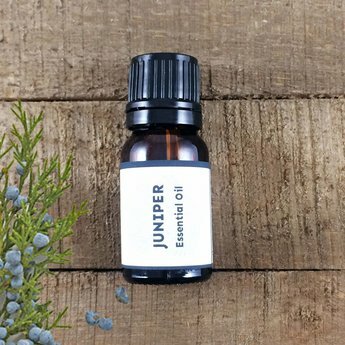 Juniper, a purifying oil that is a disinfectant, repels insects and sooths bug bites. It is also a refreshing oil to lift the spirits, and improve mental clarity. Diffuser: Juniper is a wonderful oil to add to a diffuser to awaken the mind and disinfect. (for mental clarity add lemon and rosemary and as a disinfectant add spruce and pine). For a body oil mix with grapefruit to areas with cellulite and massage deeply into the skin a couple times daily. For a joint oil mix into a carrier oil of arnica and blend with peppermint and a tiny bit of ginger. Atlas cedar, bergamot, frankincense, lavender, neroli, rose geranium, rosemary, sandalwood. Fun facts: In the middle ages juniper was burned to combat the plague. The tree was a food source for the Native Americans. In India the leaves were burned as incense. Cautions: considered Non-toxic, though should be careful with sensitive skin. It should not be used by those with kidney disease, acute bladder infections, or during pregnancy.